As I mentioned in my last blog, I’ve decided not to take the self-publishing route for my next book. “Why not?” you ask. Let’s get into the nitty gritty with the Dark Side of Self-Publishing. You would think that self-publishing is pretty self-explanatory: you’re on your own. It’s not “group-publishing” after all. So how could being on your own be an issue? Speaking with authors, listening to author workshops, and just generally knowing other people in the field of writing can be pretty darn helpful when writing a book. Not only are they available to bounce ideas off of, but those people don’t care to hurt your feelings. When you’re grouped with similar-minded authors or are at least starting to get to know people in the field/related to your work, it’s helpful to have those like-minded folk close by to call up when you’re struggling with a particular scene or needing help to find the right word for something. Now obviously that kind of description above implies you’ve already been published or are connected to network of writers, editors, etc, to call upon. If you’re not involved with one, it is something you will get forced in to when it comes to sending your book to a publisher for print. Your book will need to be edited and proofread by the publisher team and thus opening the doors to a whole new world: acceptance and rejection. Friends and family let you down easy and fluff a lot of things for you. Now I’m not saying my personal experience was like that, but it certainly helps to have someone who is more crass in their opinions of writing. Why not make that person some sort of professional in the field? Don’t do it alone! Writing a book is one thing. Learning how to publish it is an entirely different animal. When I went about looking how to self-publish, I had to be very diligent to find what company was actually a legitimate publishing company. There are plenty of websites out there that sell themselves really well but actually provide little of any results. There’s a few that will publish your book but not provide you with any income. I know, right? I won’t name names, but there were a few sites I considered that ended up having class-action lawsuits against them in other parts of the world. It’s important to do your research about these companies before you go any further with putting your hard-work to their potential scamming services. But a bit more on this later. Remember: YOU are the publisher. You are using someone else’s service to PRINT and possibly DISTRIBUTE your books for you. Therefore all of the costs around printing and possibly distributing are entirely on you. It’s strange to think of yourself as a publisher as you’re just one person, but that’s really what it is! You are your own publishing house and thus you’ll encounter a lot of the costs a publisher would have had to pay. Whether it be printing the books, buying rights to certain font, or getting someone to create the cover art of your book – it’s all on you! While the final cost of the book heavily varies on how many copies you want to have printed and the quality of the overall book, expect say, 100 books to start around $1000 in your cost. This is a rough estimate in Canadian dollars, but hey – at least you have an idea to save up for something. So yes, that’s $10 per book – your cost. You may think a book is a book: it has a cover, page numbers, a spine, an About the Author section – you’re all set. Right? NOPE! NOPE! NOPE! NOPE! NOPE! NOPE! You’re not even close! While explaining this section could take multiple blogs, I’ll try to make it concise: to guarantee your book to be mass-produced and accepted in book stores across the world (such as Amazon, Indigo Books, etc), you have to follow globally accepted publishing formats and standards to get your book into bookshelves. These are including, but not limited to: making your margins meet properly within the pages of the book, using the proper, non-copyright font (ie. Times New Roman, Garamond – just because the font is in Microsoft Office does NOT mean it’s free to publish your book with it), make sure the font on the spine of your book meets within the sizing parameters, have a barcode present on your book cover, have numbered pages, have a copyright page in the front of your book, have multiple title pages at the beginning of your book, have an ISBN number, and so on. While those are some examples, it’s important to know there are a lot of legalities to publishing a book. While your copyright claims the book to be yours, it may not hurt to register it for copyright as well. A side about the fonts: this is what caught me off-guard the most. There are fonts within your computer that you can write whatever you want in, but when it comes to making money off of your book, you’re technically using a font that is not licensed for commercial use. So if you’re DYING to use a particular font for your book, you may need to pay up. And remember: you’re on your own to figure this out! Get it right or it’ll cost you. However, if you went through a publisher, you don’t have to worry about any of that stuff. You’ve done it! You’ve wrote your book, got it published and are ready to sell! Now what? Get out there and sell! Wait, you only have friends and family buying? What happened? You printed 500 copies because you knew it was going to be a hit. Everyone said they’d buy a book! But now you’re finacally in the hole and sitting on boxes of your work without anyone willing to buy them. And there lies the next problem with self-publishing: the support. While you can take pre-orders from people before you order your books, you can’t guarantee they’ll still buy them. To make things even more difficult, once your book is published, you can’t just expect word to get out and people to flock to you for purchases. You need to advertise and you need to advertise HARD. Go to conventions, go to libraries, go to poetry readings: just get out there and start pumping your book out! I mentioned scamming services before, and I want to touch back on them. Some scamming services are even involved or connected to some of the big book stores. When it comes to trying to get your book into stores, if you’re self-publishing, you’ll have to fork out tons more cash to make it work as you’re essentially “buying yourself a spot” in a book store. When you use the self-publish service of these businesses, you’re told you’ll be guaranteed placement in stores, book signings, and the like. However it may not – and probably will not – meet your expectation in sales. It will only hurt you financially and emotionally, so it’s recommended to stay away from these kinds of places. Some places even tell you they will not publish your book until it is professionally edited by their editors. They’ll pressure you into paying or harass you to work with them as they try to make you believe there’s no one else who’d accept your book. It’s sort of like a relationship gone bad. On the bright side, if you go the route of a publisher, you don’t have to worry about doing all of the legwork yourself. Most of these publishers have their connections to the book stores anyway, so it’s just a matter of signing up with them and then bam! You’re in the book store! Remember: they want you to succeed as much as you do. They’re in it to sell your book and make money, not to scam you. This is why there’s very little – if any – upfront costs when going through a legitimate publisher. If you’re a local author, some book stores do offer a bit of help, but that requires you to find out who does that and you’re stuck doing what they ask you to do. After all, they’re providing you with a service you’d not get elsewhere. As for the fear: you don’t really know how well your book will do. You don’t know if it’ll end up dead on arrival. You don’t know if everyone who said they’d buy a book would actually buy one. You don’t know if you just sunk hundreds, if not, thousands of dollars into your book only to find yourself in the finacal hole for the next couple of years. You don’t know and it’s pretty freaking scary. But take solace: because you wrote a book and saw it through to its conclusion. I self-published my book and I saw my book through its conclusion. While I’m quite happy with how it went, I know it could have done better if I only had all of the time in the world to do what needed to be done. Unfortunately that’s impossible unless Earth conveniently switches to 54-hour days. I enjoyed self-publishing and I got a kick out of learning all of the legalities and rules behind it. But I’m a strange person that enjoy boring things like that. You? Probably not so much. And while I did enjoy learning the ins and outs of self-publishing, I feel like I’ve put all of that behind me. I set out to make my own book – and I did it. Me and no one else. Going forward, however, I do not feel like shouldering the responsibility of self-publishing again. There were a lot of things I could’ve done better – such as advertising, getting my book into stores, and having more professionals check out my book before it went to print. 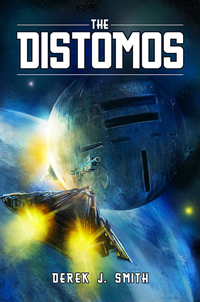 Alas, I didn’t and yet my book, The Distomos, still exists. I’m still really proud of it and glad it’s done. So while I made self-publishing to sound scarier than it probably is, it’s more or less just a lot of work. A LOT of work. And also making sure you’re doing your due-diligence. Personally, I do not feel like doing that all over again. But that’s not stopping me, and I’m excited to see where my new venture takes me. If you have any questions, stories, or comments about self-publishing, please let me know in the comments below. I’ll do my best to address everything you throw at me! Derek, I think you have a lot of good insights in this post, and I agree with you. I self-published a couple of books before I got my contract with Samhain, which obviously is a much better deal. However I think you neglected to mention an important aspect of self-publishing which I think is a useful tool for indie authors, and that’s e-books. Most of your post deals with the burdens of getting a print volume out there. Readers of indie authors are far more likely to discover you, however, via an e-book, where the barriers to entry are much lower. For example, one of my early self-published books, which is an expensive monster in print, has actually done pretty well as an e-book when priced very low. I’ve also put out short story collections and even individual short stories as e-books for free, the idea being they’re “loss leaders” that help readers discover you and whet their appetite for your other works, which hopefully will be coming from a royalty publisher with a much stronger market reach. There are readers and book bloggers out there who consume staggering amounts of books. Usually they’re genre specific; a romance or horror fan will have dozens of books in her queue and read a couple of them a week. The readers who do this almost always read e-books. Getting into this stream, and coming to the attention of high volume consumers of genre books–usually through social media–is still quite possible for self-published authors, though you’re totally correct to point out that it’s far more labor intensive (and expensive) to do it yourself rather than go through a royalty publisher. Now the career trajectory of many writers is to start out self-published, make the jump to a small press and then work your way up through increasingly wide-ranging publishers. I agree with you: e-books come for much less money and require a lot less in up-front costs than publishing a physical book would. I do feel that still self-publishing an e-book requires one to still follow a lot of the rules I have said above – and as you mentioned, could potentially be a loss leader. It really boils down to how much effort, both financially and emotionally, you want to put into making the book happen. And while self-publishing an e-book doesn’t come free either, it certainly does help getting your foot in the door.